We’ve all been caught short in public desperately looking around us for the easiest option to relieve ourselves. But at what cost? 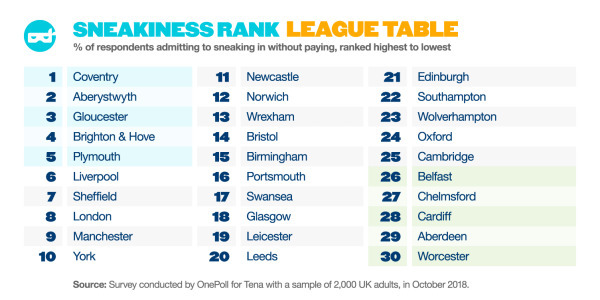 Here at TENA, we were intrigued to see just how much Brits spend when they have full bladders – either using businesses’ facilities or a public toilet – so we took out a survey to find out how much this set them back each year. How many people go for a pint at the pub to give them safe passage to the toilet when they’re busting for a wee? Do some Brits pay for a pee only to succumb to ‘stage fright’ and are then unable to go? TENA also ran a hidden camera social experiment which saw people walking into different public spaces and asking to use the toilet for free. Yes, you read that correctly. 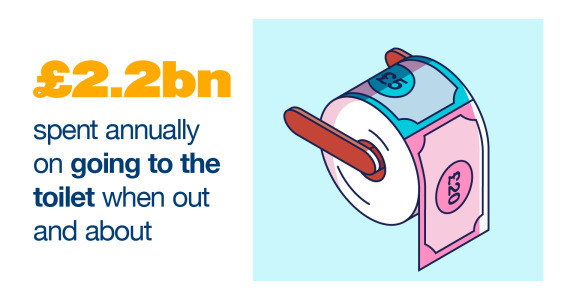 As a nation, we pay a staggering £2.2 billion for the privilege of going to the loo every year. 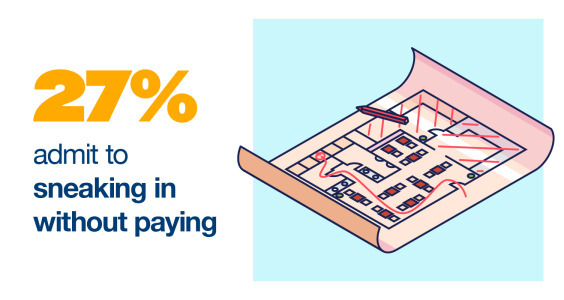 Whether that’s paying for a full meal at a restaurant or slotting a couple of coins into a station turnstile, we pay £47 each on average for trips to the toilet across the year. Remarkably, a quarter of us will pay for the opportunity to have a pee only to then freeze and not be able to go when facing the toilet or urinal. Is it the pressure that defeats you even after parting with your precious cash? 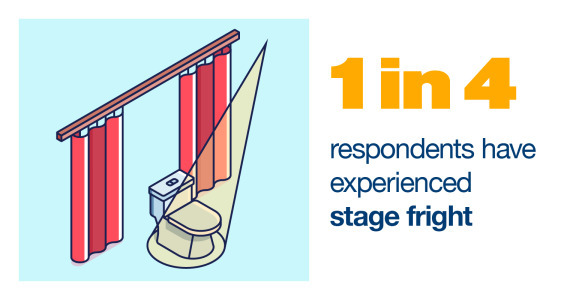 Read our interview with shy bladder syndrome expert Andrew Smith to find out more about stage fright. 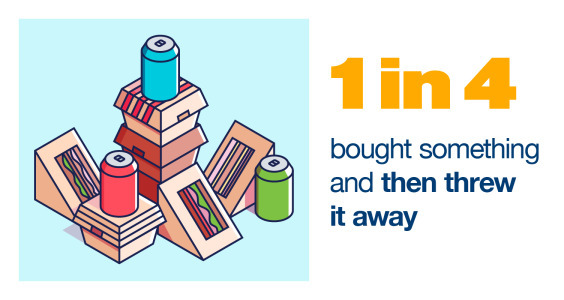 The lack of care we have for the item we buy can be startling – our survey found that 25% of us chuck it away having been to the toilet. Considering that toilets can be so pricy to visit, it is perhaps no surprise that people would attempt to stealthily nip into the loo without paying. According to our study, over a quarter of people try to catch businesses’ staff unawares and evade them in order to get to the loo. 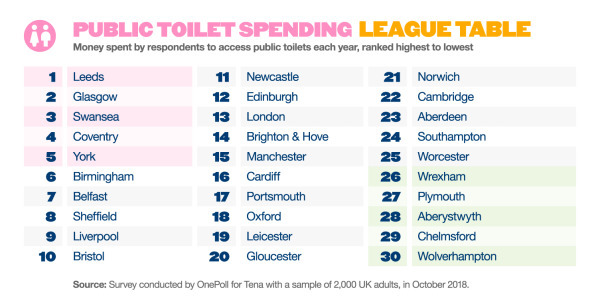 Check out our insightful map infographic to discover how much people spend on average to visit the toilet when out and about in your town each year alongside other illuminating stats! And if you think that you may be going to the toilet one time too many then it may be worth looking at our page about the causes of urinary incontinence. If you are worried you may be affected though, please consult your doctor to discuss your concerns.